Just finished the IAPHR conference in St Louis. Twas nice to get to present copies of my book to the student presenters. 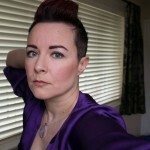 Not sure my usually combative style went down well….I may have been on a mood high….swung to a low right now so have avoided going out with the others for a final pizza. Biplor 2 – good article in the Telegraph. That’s enough for today. Will probably be quiet for a few days….normal service will be resumed soon enough. when I can. This entry was posted in Complete Blog and tagged book, bws, conference, conferences, mental health on 19 October, 2015 by Terry. This entry was posted in Complete Blog, DCE support, Economics, Surveys and tagged book, bws on 11 August, 2015 by Terry. Not a lot to report I’m afraid. I have booked everything for the IAHPR conference in OCtober (St Louis, USA) so anyone going, please say hello. Not heard of any delays to the book publication, so I hope September is still the launch! This entry was posted in Complete Blog, DCE support and tagged book, bws, conference, IAHPR, TF Choices on 2 August, 2015 by Terry. Sorry for radio silence…..I am reading the proofs for the Best-Worst Scaling (BWS) book. I am a co-author on the theory chapters and also a co-author on three of the nine contributed empirical chapters. But if all goes to plan it will be on sale by Cambridge University Press in September….October at the latest. This entry was posted in Complete Blog, DCE support and tagged book, bws on 10 July, 2015 by Terry. 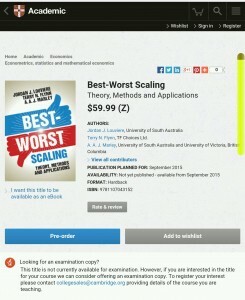 For all you patient people out there, an update regarding the upcoming book which will be the definitive textbook on Best-Worst Scaling, published by Cambridge University Press. My two co-authors and I have gone 13 rounds with the copy editor to resolve outstanding queries surrounding tables, figures and references. We believe those are now all sorted. There are just a few edits to be made to update affiliations of a number of contributors/authors (including my own) and we’re there. Assuming that is the case, CUP will issue us the complete proofs at the end of this month, wanting editing from us to be done the following 3 weeks. The book will then be scheduled for publication in September. I do not know of any specific conference at which it might be “launched”, but assuming the timelines don’t change any further, the IAHPR conference in St Louis (just before SMDM) would be a logical one – all attendees would be highly interested in the topic and I know many use BWS already. One little moan that I know I have made before but which bears re-iterating. Jordan, Tony (especially) and I have spent an enormous amount of time over a period of 10 years proving various theorems, estimators for use in BWS studies, and comparisons of results across BWS studies in various disciplines. Yet before I resigned from academia I was already beginning to see papers (in heath particularly) that seemed to think they had some “spin” on it that enabled them to claim another version of it, or suchlike. I want to make it crystal clear that I welcome proper theory-based work to build on what we have done. Professor John Rose has already done some absolutely amazing work to build on ours and deserves special mention for his belief in the power of the methods, for his constructive (and generally deserved) criticism of some parts of what we have done to date (reflected in the book), and his desire to push for BWS to be implemented more generally. He has already been producing optimal designs for BWS studies (Case 3) – since (if I remember correctly), he has already proved that the BIBD is the optimal design for Case 1 and OMEPs for Case 2 are at worst satisfactory – they might just not be the most efficient, but he and I share a view that efficiency is not the be-all and end-all. Frankly, I am absolutely gobsmacked at how quickly he can work when it comes to moving forward something in choice modelling that he believes in. We have still not managed to publish together, but I look back on the all too little amount of time we worked together with great fondness. I believe he will be a major force in pushing forward the boundaries of BWS in future. To others, who introduce atheoretical “tweaks” – sorry, I really really don’t like that. Why have you not had a mathematical psychologist or top econometrician prove the properties of the estimators you have used? Vague hand-waving would not pass muster in a journal conforming to CONSORT guidelines in RCTs, so what gives you the right to think you can do that in HSR journals that publish DCEs? Yes I know publishing is hardly my main focus anymore, but as I mentioned yesterday, I won’t be abandoning it entirely and I will be doing a little bit of reviewing. And I am sorry to say that the “players” in academia will get no truck with me. Do it properly or don’t do it – this is usually tax-payers’ money being used. Remember that. Spending it on studies that have no way to replicate them or have dodgy design properties represents a misuse of public funds. This entry was posted in Complete Blog, DCE support and tagged book, bws, conferences, IAHPR on 14 June, 2015 by Terry.